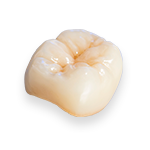 These crowns are highly aesthetic and have the ability to be used on all types of restorations. They consist of a zirconia substructure and are veneered with porcelain. The strength and accuracy of the substructure cannot be questioned as they are designed and milled on state of the art CAD/CAM systems. For all the benefits of zirconia this restoration is very flexible and offers alternatives for full mouth restorations, crowns, bridges for both anterior and posterior regions of the mouth.